This is the best compact crossover for you if you’re looking for one of the best-looking, best-driving, most refined, and most fuel-efficient in the class. It’s a rare vehicle that balances all these attributes, and the 2018 Mazda CX-5 is one that does. Making this range of attributes more remarkable is that Mazda is a small, independent automaker. It lacks the massive research, development, and marketing war chests of companies such as Ford, General Motors, Honda, Nissan, or Toyota. To maintain brand image and improve profitability, Mazda is taking its products upscale. This is evident with opulent new flagship Signature versions of its seven-seat CX-9 midsize crossover and Mazda 6 midsize sedan. With interiors trimmed in Nappa leather and fine wood, they’re among the most refined and the more expensive entries in their segments. 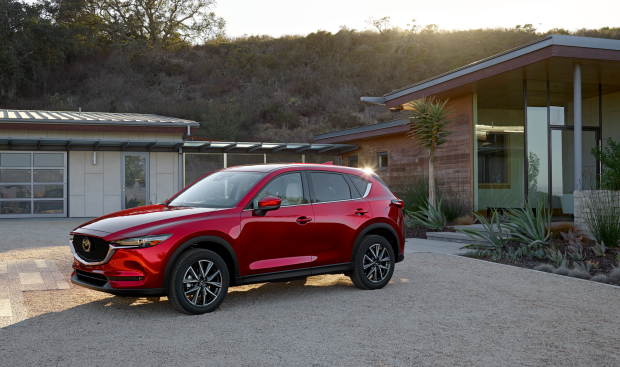 The top-line 2018 CX-5, the Grand Touring model, accounts for nearly half the compact crossover’s sales — which are up an astounding 75 percent through the first quarter of 2018. Still, CX-5 demand still trails those of segment sales leaders such as the Chevrolet Equinox, Ford Escape, Honda CR-V, Jeep Cherokee, Nissan Rogue, and Toyota RAV4. It does, however, outsell such segment stalwarts as the Hyundai Tucson, Kia Sportage, Subaru Forester, and Volkswagen Tiguan. In the market for a small crossover now? Put the 2018 CX-5 high on your shopping list. Following a model-year-2017 freshening that tweaked styling and features, the 2018 CX-5 gains more standard safety gear and introduces innovative fuel-saving cylinder-deactivation technology, a first for a production four-cylinder engine in the North American market. Purchase date in the future? It might be worth waiting for the 2019 CX-5 because Mazda plans to debut its long-awaited turbodiesel engine as a second CX-5 powerplant. In development for nearly a decade, the diesel should finally be ready for launch in the North American market. It’s also possible the automaker could add a third engine choice, a more powerful turbocharged gasoline four-cylinder. And with Signature versions of the CX-9 and Mazda 6 proving popular, one could be in store for the 2019 CX-5. The 2018 lineup returns three trim levels: base Sport, mid-level Touring, and upscale Grand Touring. 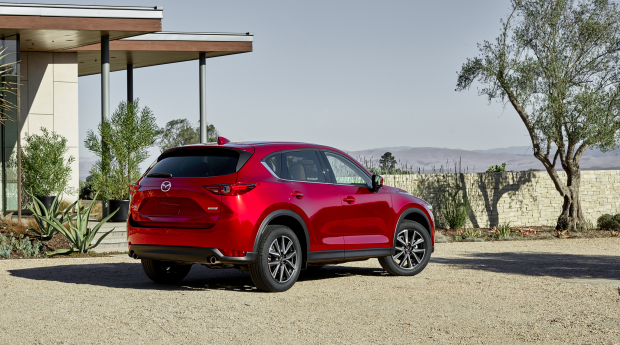 Styling: Mazda dubbed the 2017 CX-5 “all-new” and “second-generation” but it really was a significantly freshened version of the crossover that went on sale for the 2013 model year. The ‘17’s interior and exterior styling did get noticeable updates, but the drivetrain and underskin engineering was largely unaltered. The only styling change of note for 2018 is addition of 19-inch wheels as standard equipment on the Touring model, replacing 17s. The interior is simple, yet contemporary. Materials quality is above average in the Sport and Touring, and class-leading in the Grand Touring, thanks to its sophisticated two-tone design and ample use of visible contrast stitching. Most of Mazda’s other vehicles have an instrument panel that places a tachometer dead ahead of the driver, with the speedometer consisting of a smaller digital readout. 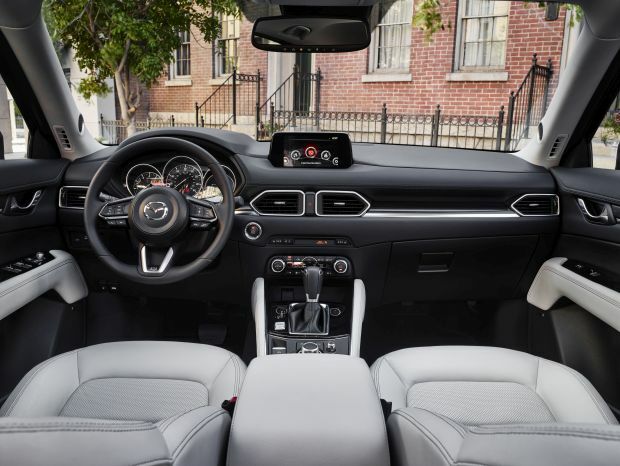 CX-5 eschews this in favor of a more traditional cluster with the speedometer in the center, tachometer to the left, and fuel/temperature indicators to the right. The layout is fine, with secondary readouts governed by a button on the steering wheel. All models employ a tablet-like 7-inch infotainment display that sits atop the dashboard. Instead of a touchscreen, you use a center-console-mounted knob flanked by buttons like BMW’s iDrive. This arrangement generally works well, but without dedicated radio preset buttons, programming your preferred stations takes far too many steps. There’s no CD player. Mazda figures the young, upscale buyers it’s targeting will use their smartphones for streamed or downloaded music. The infotainment system supports some streaming apps, such as Pandora and Aha, but the lack of Apple CarPlay and Google Android Auto support is a missed opportunity. The climate controls are mounted a bit low on the dashboard, and until you’ve memorized the button positions, it can require a longer-than-expected look away from the road to tweak the settings to your liking. Passenger room is class-competitive. The supple leather upholstery in the Grand Touring feels nice on your back and legs, but aggressive front-seat bolsters might confine larger folks. The low-set rear cushion and somewhat high beltline will make smaller passengers feel somewhat submerged. At least the backrest now reclines, which improves comfort. Its model-year ’17 refresh saw cargo volume decrease to slightly below the class average at 30.9 cubic feet behind the rear seatbacks and 59.6 with them folded. It helps that the rear seatbacks fold in a 40/20/40 arrangement rather than the usual 60/40 split. The available cargo cover attached to the inside of the liftgate, rather than to the sides of the bay, which is rather awkward. Interior storage is unexceptional, hampered mostly by a center console that’s on the small side. Mechanical: On paper, the CX-5’s powertrain looks a little out of step. Turbocharged four-cylinder engines displacing 2.0 liters or less, and continuously variable transmissions or automatics with up to nine speeds, are increasingly pervasive in this class. Happily, Mazda’s decision to stick with a relatively large, naturally aspirated 2.5-liter four-cylinder and a six-speed automatic has impressive results. Output is in line with most rivals at 187 horsepower and 186 pound-feet of torque. The CX-5 accelerates smoothly, and it has a surprising amount of mid- and high-speed passing punch. Credit the smartly tuned transmission for getting the most out of the engine. All grades are available with a choice of front-wheel drive or all-wheel drive (AWD). More than half of CX-5 buyers choose AWD. Smart decision. You won’t bash rocks in this crossover, but its AWD system improves dry- and wet-road grip without taking a significant toll on fuel economy. Also inspiring on-road confidence are excellent steering feel, astute suspension tuning, and Mazda’s G-Vectoring control, which lightly brakes the engine as you enter a corner. This tips the nose slightly, resulting in enhanced turn-in. Our only handling gripe is that bumpy corners can result in some deflection in Touring and Grand Touring models because of their 19-inch wheels. Ride comfort is on the firm side of the spectrum, but it’s not punishing, even with the 19-inch tires. Refinements to the engine and extra sound insulation result in a cabin that is more hushed than most. The tires rumble some on coarse pavement, but it’s not enough to be overly distracting. Features: Even the entry-level CX-5 Sport comes quite well-equipped out of the box with standard push-button ignition, LED headlights, HD Radio receiver, dual front-mounted USB ports, leather-wrapped steering wheel and shift lever, and 7-inch infotainment system. On the safety front, the Sport includes blind-spot alert, rear cross-traffic detection, and Mazda’s Smart City Brake Support, which is a form of autonomous emergency braking that works at speeds less than 19 mph. It can bring the vehicle to a halt to avoid hitting another vehicle or pedestrian. Touring models add 19-inch wheels, keyless access, power driver’s seat, heated front seats, dual-zone automatic climate control, rain-sensing windshield wipers, leatherette upholstery, and two USB charging ports for rear-seat passengers. Also standard on the Touring is Mazda’s i-ACTIVSENSE, which is a suite comprised of full-speed adaptive cruise control, lane-departure warning with automatic steering to help keep you in your lane, automatic high-beam headlights, and an upgraded version of Smart City Brake Support that works at speeds greater than 19 mph. The Grand Touring gains LED fog lights and taillights, steering-linked headlights, a programmable power rear liftgate (though hands-free operation is unavailable), memory driver’s seat, power front-passenger seat, leather upholstery, a power sunroof, Bose-brand audio system, and imbedded GPS mapping. Pricing for the 2018 Mazda CX-5 tracks slightly higher than that of most rivals. Further, Mazda does not incentivize its vehicles as heavily as larger automakers do. Still, you won’t find many other SUVs of any stripe that can match the CX-5 for driving engagement and overall refinement, and that’s what makes it a very good value for money. With front-wheel drive, the CX-5 Sport starts at $25,125, including $975 destination fee. Front-drive versions of the Touring and Grand Touring have base prices of $27,190 and $30,620, respectively. AWD is a $1,300 option on all models, and certain paint colors range from $200-$595. You can add the Touring’s i-ACTIVSENSE features to the Sport for $625. The Touring’s $1,200 Preferred Equipment Package adds an auto-dimming rearview mirror with built-in garage-door transmitter, Bose audio system, imbedded navigation, power sunroof, and power liftgate. Grand Touring grades have a $1,395 Premium Package that adds a head-up instrument display with traffic-sign recognition, heated outboard rear seats, a heated steering wheel, and windshield wiper de-icer. The $30,285 Touring with AWD, Soul Red Crystal paint, and Preferred Equipment Package is our pick of the CX-5 litter as it offers the best balance of convenience, technology, and safety equipment. Despite its large-displacement engine and 6-speed transmission, the 2018 Mazda CX-5 remains near the top of the competitive set for fuel economy. EPA-estimated ratings are 25/31/28 mpg city/highway/combined for front-drive models and 24/30/26 for those with AWD. Our test AWD Grand Touring returned 26.3 mpg in our suburban test loop. All models use regular-grade 87-octane gasoline. Note that CX-5 is the first production vehicle in North America to employ fuel-saving cylinder deactivation in a four-cylinder engine. The motor shuts down two of the cylinders at cruising speeds. The process is completely transparent. Mazda’s long-awaited turbodiesel engine is scheduled to make its North American debut on the 2019 CX-5. It is expected to be a 2.2-liter unit with an estimated 173 horsepower and 310 pound-feet of torque. If Mazda elects to add a flagship Signature grade to the lineup for 2019, there’s a chance it could use a variant of the 2018 6 sedan’s 2.5-liter turbocharged four-cylinder, which has 250 horsepower (using premium-grade 91-octane gasoline and 227 horsepower on regular) and 310 pound-feet of torque. The addition of either engine would make the CX-5 one of the most potent small crossovers and be a genuine alternative to turbocharged versions of the Ford Escape and Subaru Forester.